In an earlier post I tried to differentiate between the manner in which I commented on the altered pictures removed by Reuters and the manner in which the right wing blogs commented. While they deserve credit for uncovering the alterations, I was ultimately bothered by the degree to which they tried to turn this into a major media scandal. It is of some value when a photographer is exposed for altering a photograph. If honest reporting is the goal, then those who expose the alterations deserve credit. However, if the goal is to undermine the credibility of all photographers and reporters, or to perpetuate their myth of liberal bias in the news media, then this particular discovery is far from sufficient to demonstrate their case. The Milan daily Corriere della Sera reported that the victim’s father had applied for Italian citizenship two months ago. Applicants must convince authorities that they also embrace “fundamental” rights, including the right of a woman “to choose her own life”, said the interior minister, Giuliano Amato. Fat chance he’ll convince anyone now. The Lippard Blog responds to Routh Type’s description of the blogoshere as “an innocent fraud.” It’s another rehash of the A-list vs. B- and C-list blogs. Lippard’s response centers around the number of people even a smaller blog reaches. For many of us, having the number of people who read what we right is significant, even if less than the number who read the A-list blogs. Size is relative. Sure, we are smaller than the A-list blogs, but we’re all smaller than Time Magazine or virtually any network television show. That doesn’t mean that our blogs don’t get our writings out to a meaningful number of people. B- and C-list blogs don’t get the same number of readers as the A-list, but that doesn’t mean our writings are ignored. While writing at The Democratic Daily and Light Up the Darkness I’ve been I’ve been quoted in the web sites of publications ranging from the National Journal to CBS News. Contrary to the argument that A-list bloggers only link to each other, we received links from blogs such as Crooks and Liars, Real Clear Politics, and Talking Points Memo. Starting over with my own blog obviously means a reduction in readers while I build this one up, but in a the past week I’ve received links from Daou Report (twice), and many links from the aggregators at Memeorandum and Megite. There are also numerous other smaller sites which list blog posts, providing a source of new readers for even the smallest blogs. Is all lost for the B- and C-list bloggers? Not according to “long tail” theory. Wired magazine editor-in-chief Chris Anderson has made a study of the geometry of the curve and argues something surprising: Because the tail goes on infinitely, the C-list, in aggregate, has a much larger audience than does the thin A-list section. This means there are infinite niches for B- and C-size blogs. We know that right wingers see the news different from everyone else. 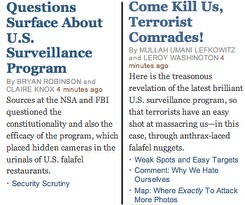 Huffington Post has perfected a web translator which shows how they see The New York Times. The example above shows the real article on the left and the wingnut version on the right. Kerry finally plays well in S.C. When U.S. Sen. John Kerry announced he was coming to South Carolina to talk about health care and raise money for the state Democratic Party, one could almost hear the groans from Greenville to Charleston. What’s that liberal Yankee doing down here? We showed him two years ago what we thought of him. South Carolina voters preferred President Bush by a wide margin, 58 percent to 42 percent. Skeptics said the Massachusetts Democrat would be lucky to draw a dozen or so people. Kerry had the last laugh when he hit the state late last month. The reception also seems to show the could-be presidential candidate will treat the state differently than in 2004. Overflow crowds greeted Kerry at a Charleston town hall meeting and a Democratic rally in West Columbia. Charleston Mayor Joe Riley introduced him at the town hall gathering. Party officials say they were not prepared for the response. A recent post has another story on Takai under the fold. Additional Star Trek stories are reposted below. Perhaps this is due to more people realizing that being bogged down in Iraq, and helping al Qaeda recruitment, is not keeping us safe. George Bush isn’t helping matters with his absurd defense of his policies, such as at a Lynn Swann for Governor Reception earlier this week. Bush warned that, “If we leave before the mission is complete, if we withdraw, the enemy will follow us home.” I guess this was just his subtle way of answering Joe Scarborbough’s question, Is Bush an Idiot?